The world's best beloved realtime satellite tracking system! It was in 1992, and I was looking for new horizons in my amateur radio station. I had done it all, or almost so. Satellites were the single major frontier I had not yet explored. So I started setting up my satellite station, starting small and improving it step by step. In 1994 I reached the point where I needed directional antennas and a computer control system to keep them pointed at the satellites. There were several systems on the market for just that purpose, but they were all expensive, and most didn't perform very well. So I decided to roll my own. I designed a simple interface to connect the antenna rotator to the computer, and wrote a program that calculated the position of any desired satellite and sent the azimuth and elevation data to the interface. So far, so good. My problem was solved. Soon later a colleague asked me for a copy of that program. Since it was still very rustic, I added a basic user interface to it, and released it as version 1.0 into the public domain. The rest, as they say, is history... Many people started using FodTrack, made suggestions for improvement, reported bugs, and I kept releasing one version after another, over 20 versions so far! Most of this development happened in the first five years; after that, the system stabilized, and since then I only occasionally add some new features. At this time, FodTrack controls both the antenna aiming, and the radio equipment, and can be run in manual or in automatic mode. It has a GPS interface for time and position setting, so that it can be used in mobile satellite stations. It is highly configurable to the requirements of each station. And what is its best liked feature, it's completely free for amateur and other non-commercial use! Only if someone uses it for profit, I would like a modest share of the money made that way! 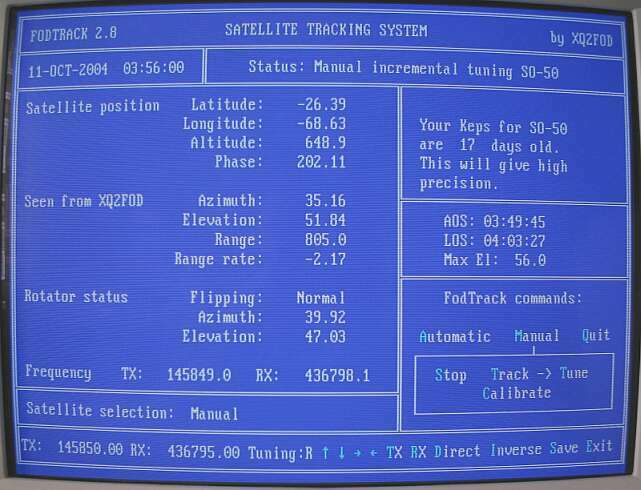 FodTrack is still a DOS program, designed with a view towards optimal performance in DESQview, which was the best multitasking environment available when the program was first created. However, it works well in Windows, as long as you configure a DOS window with direct hardware access, which is needed in order to write the special output required by the rotator interface. I presently use it under Windows 98, but other stations are using it under Windows 2000, XP, and NT, and also Linux (with DOSEMU). This is how the FodTrack screen looks during typical operation. To get a very true-to-life look, I shot the full-screen image with my tiny digital camera, including all that camera's gorgeous barrel distortion! FodTrack calculates the satellite position every second, and sends updated position values to the antenna rotator. It also calculates the Doppler shift caused by the relative satellite motion, and sends updated transmit and receive frequencies to the radio. It can control a variety of Icom, Yaesu and Kenwood radios, plus a few scanners and other odds. It sets modes and subtones too, and it can manage operation through transverters up to the 24GHz band. If you have a radio that isn't supported, you can ask me to add support, or make your own driver and tell FodTrack to send the frequency info to a disk file every second. All configuration is through a text file. Commands are entered by single keyboard strokes. The mouse can rest... This is good old DOS practice, and I love it so much that I don't want to give FodTrack a point-and-click interface. I find keyboard control so much more practical! All valid command letters are highlighted on screen. And if you don't like the colors, they are fully configurable to match your taste. This is the schematic diagram of the FodTrack rotator interface. It's basically a dual-channel digital-to-analog converter fitted with window comparators to set the rotator to the desired positions. This interface has become so well known that many people are using it with third-party software, in addition to those who use the complete FodTrack system. You can choose between building it from scratch, or buying it ready made from AMSAT-CE. The printed circuit design and component layout are provided in the package. Of course, it's less expensive and more fun to build it, but the AMSAT-CE option is there for those who are too lazy to wield the soldering iron. This is a serial port interface for controlling radios such as the popular Yaesu FT-736. The FodTrack package includes three such schematics: This one for Yaesu, one for Kenwood radios (which use a different polarity), and an extremely simple one that is for control only (no reply) of Yaesu and Icom radios. The entire system is distributed in two ZIP files. One contains the software, configuration files, the complete manual, the entire history of FodTrack, and a sample Keplerian data file which will surely be outdated by the time you download it (but you can get a fresh one from AMSAT ). This file is quite small, less than 100kB! That's one of the nice things about DOS programs. The second file contains all the drawings: The two shown on this page (in 300 dpi quality), the other two radio interfaces, and the printed circuit board for the rotator interface. This file is about 500kB long. You need to download the second file only if you are a first time FodTrack user, since the drawings haven't changed for many versions of FodTrack. For a long time, I was at a loss when users asked how exactly one could run FodTrack under Windows XP. Some users told me they had no problem, while others absolutely couldn't get the program to talk to the rotator interface. Here is the explanation, and the solution! Windows XP (and NT, apparently 2000, and surely Vista too) places a barrier between user programs and the computer hardware. Windows 98 and older versions, DOS, DESQview and other systems do not. When I wrote FodTrack, many years ago, it was normal for user programs to write to the hardware. So FodTrack does just that, and when running under Windows XP or similar, these hardware write instructions don't get through, so the FodTrack interface doesn't work. I'm not the first programmer to be upset about this blockade. So, some programmers who are more clever than I will ever be, came up with drivers that open up hardware access for application programs. The best known of these drivers might be GIVEIO, but on my laptop it did NOT work with FodTrack! Don't ask me why, because I don't know. But then I came across UserPort, and this works perfectly! At last, the Fodtrack software can talk to the FodTrack hardware again, with UserPort overcoming the silly barrier imposed by Windows XP! For your convenience, I'm providing UserPort here, with thanks expressed to its author, Tomas Franzon. Download and unzip this file, read the PDF manual included in it, install it following these instructions. The default configuration works well if you use any of the normal ports. If you use nonstandard ports, do add their address ranges in the configuration. That's it, FodTrack and Windows XP will now work happily together! If you want to disable and re-enable UserPort for testing purposes, you can do so from the Control Panel, System, Hardware, Device Manager. Select "view" and "show hidden devices". Under "non-plug and play drivers" you will find UserPort, and you can disable and enable it from there, if desired. Normally there should be no need to ever get in here. Just installing UserPort should work for most of us! If anyone can tell me if this works under Windows Vista too, I would like to include the results here.